Perhaps a better (though less marketable) title for Gary Kaminsky’s (Gary) book, would be INVOLVEMENT. The author sets the tone for his investing process, by stating that the “next 10 years will be like the last 10”. But he also warns that with the opportunity for wealth creation will not be met through passive investing. Success in a ‘nowhere’ market, requires a good deal of discipline, something adhered to only by a minority of investors. As you can see, this is how INVOLVEMENT drives the process we will review. Gary rehashes many of the things many of us should know: the only person who cares about your wealth is you; don’t base your decisions on what the TV talking heads promote (many of which don’t even own what they recommend); buy & hold does not mean buy & forget; don’t average down, and; you should only buy a stock if you know what your future sell plan is. In summary, success comes from the aforementioned discipline. Reality dictates that most people are currently observers, not investors. Gary also tries to reinforce his forecast for the next 10 years by emphasizing that fewer people, due to the current financial crisis, will participate in the market. Ironically, as I was finishing the book, I came across two articles. One, from a national newspaper, proclaimed The Great Stock Exodus; the other, from a US advisory magazine, expressed concern that Gen X and Gen Y people are confused about post-recession investing and less willing to enter the market. And, currently, there is the flight to bonds despite the reality of future interest rate increases. Remarkably, with all of the investing books and newspaper articles available to the average person, people are still directionless when it comes to the growth of their wealth. Most readers should be aware that there is simply a ton of cash on the sidelines as people await the next anticipated crisis. Chillingly, Gary proclaims there will indeed be another crisis (yikes). The book contains a mandatory selection of lists: Wall Street’s Greatest Myths; The 8 Rules of Investing (from Dean Carney); The 8 Pillars of Change, and; The 5 Tenants of Stock Selection. The Myths section can be best summed up by asking the question ‘who exactly is Wall Street working for ?’. As Peter Lynch pointed out in his classic “One Up On Wall Street”, the active investor does in fact have some advantages over the professional (sometimes corrupt) money manager. Gary simply reinforces that view. The other lists relate to the investing process, with the focus on analysis. This is truly where the book separates the men from the boys. As noted above, success comes from discipline and a commitment of time. There are no shortcuts. Sure, the web has made the process more efficient and expedient, but a true investor has to commit to the type of process that Gary describes. Research comes into play when selecting a stock, watching the stock (identifying changes), and then preparing to sell that stock. Remember, he advises the investor to review her holdings on a weekly basis: just a tad challenging for someone who struggles to simply comprehend the monthly mutual fund statement. Gary’s focus on analysis (read: Homework) is refreshing in a few ways. With a case study, using General Electric (GE), he does a nice job of differentiating the value of the marketing tool we call the annual report vs the comprehensive 10K report (the truth document – for US stocks). In Canada you can pull the comparable annual information document from the Sedar database. An active investor, though, needs to commit to understanding and analyzing financial statements and the endless footnotes that lead to the essential truths. This, again, gets back to the INVOLEMENT side of active investing. The author touches on a key analytical tool through a case study of Disney – identifying the 8 Pillars of Change. It should not come as surprise to the reader that this can be a time-consuming process, despite the availability of numerous media outlets and portable electronic devices. In a nutshell, Gary outlines the 8 key things to watch for, that can signal a potential change in the value of a stock holding. Some changes are company specific, while others are more broad based. As a close-to-home example, many readers need only look at the chart for BCE back in 2008, when the Ontario Teacher’s Pension Plan acquisition was derailed. Staying in touch and having a finger near the sell button would have saved substantial sums. And you thought BCE was a buy & hold stock ! Gary goes on to explain the reasons for establishing the ‘ideal’ number of stocks to hold, with an emphasis on careful selection. He also points out that you only need an investment batting average of roughly .600+ to succeed. As an active investor, you must be prepared to manage a dynamic portfolio. Additionally, you must be open minded about the size of the companies you will consider (small cap, mid or large). The author reiterates the lesson as provided by Peter Lynch more than 10 years ago: don’t pursue the immense portfolio, leading to di-worsification. Gary’s opinion, is that overdiversification (yet another Wall Street myth) is nothing more than a CYA exercise. 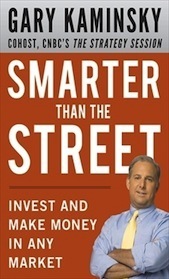 In the final chapter of Smarter Than The Street, Gary outlines his selling strategy in an effort to help readers maximize returns and minimize losses. Like many other financial writers, he points to the need to separate emotions from selling decisions. As mentioned earlier, he isn’t strictly a buy & hold kind of guy, though he will hold a position for 3-5 years (or until the next flash crash, or the next financial crisis, whichever comes first) if conditions warrant. There is nothing wrong with closing an investment mistake (we all have to do it – remember the batting average) and directing the proceeds of the sale to a better opportunity. In fact, Gary believes the first loss is the BEST loss – if you learn from the process. There is also nothing wrong with ‘trading around a position’: selling only a portion of a specific holding, and then re-acquiring more shares when prices meet defined entry points. Going in and out of a stock can sometimes be quite rewarding. Finally, one of the last nuggets mentioned in the book is the lesson related to the fear of taxation. A truly active investor cannot delay liquidating a well-timed sale. The author could have used the Nortel example, but let me relate the lesson. I can’t recall how many people refused to sell Nortel at its peak, because they would have to provide the government with a hefty share of the profits. Isn’t it remarkable how the impending descent of the ‘bubbled’ Nortel share price resolved this particular problem. The point is, when the analysis points to a sale, remember Nike, and just Do It !! Gary Kaminsky provides a good planning process to replicate his success in the industry. But the value of the guidance is a direct result of a person’s willingness to embrace the knowledge, discipline and time required to bring the process to fruition. Individuals truly can be successful as active investors. The reality (proven time and time again) is that success is limited to the few. If you are ready to commit to this comprehensive process, Smarter Than The Street can be coupled with Lynch’s One Up On Wall Street as your first point of entry. For the truly committed student, also look into Benjamin Graham’s The Intelligent Investor. If Kaminsky is right, and we’re about to face another range-bound market, then the timing is right to consider the discipline of active investing. Otherwise, simply buy any mutual fund or exchange traded fund, and pray.